August is the year’s leading month for vacations and travel, and the economy is beginning to show signs of recovery, so the question arises: Where should you go (next August if not this) for a world-class, on-site wine experience? As the happy occupant of the World’s Best Job, I’ve been fortunate to travel the wine world several times over, and since it includes so many fascinating and beautiful places, this is a tough call. However, for those making a first foray overseas, your initial pilgrimage should probably take you to France, which still makes the world’s best wines. Visiting vineyards and wineries in France has always been a marvelous experience. Yet it has not always been an experience available to just anyone, nor has it always been the relaxed and customary activity that it is now becoming. Twenty years ago, knocking on a winegrower’s door in the hope of popping in for a taste and a tour was not a great idea. The most likely response to your knocking would have been no response at all, as proprietors rarely kept anyone standing by to receive visitors. If you were lucky enough to catch someone on the premises, you would probably have been regarded with curiosity. Or even wariness. This is not to suggest that French vintners were ever inhospitable. Indeed, winegrowers across the country have long been generous with their time, and I’ve put more than 150 of them to the test on this over the years. However, while French growers are accustomed to welcoming members of the international wine trade, the trend toward an open door policy for consumers is a relatively recent development. Today, wine lovers unaffiliated with the trade will find many producers prepared to greet them. This is especially common in Champagne and Alsace, but most other regions are opening gradually as well. Targeting larger producers will enhance your odds for a pleasant impromptu visit, though your chances to encounter the actual winemaker are greater at smaller establishments. Appointments remain advisable even if they are decreasingly necessary, as they are often rewarded with more extensive tours and tastings. Wine merchants are generally willing to arrange appointments for consumers by working through importers, and the appointment process serves to set both visitor and proprietor at ease, alerting everyone to potential problems like a language barrier. Such barriers are often easy to surmount with advance notice, since many producers employ at least one English speaker. Whether you visit by appointment or spur-of-the-moment impulse, your appreciation of wine will be enhanced immeasurably by seeing how its character is informed by the characters of those who conjure it from the earth. Great wine is a personal statement but also, uniquely, a beverage of place, deriving its nuances from the lay of the land, the savor of the soil and the character of the climate. Painters and photographers know that sunlight differs everywhere across the world. Grapevines know this too, and they translate it into subtlety where the sun is stingy and dramatic ripeness where the sun is searing. To see and taste in the same place is to understand this. This extraordinary establishment is housed in a former Capuchin monastery just outside the lovely town of Kaysersberg. The property has been owned by the Faller family since 1898, and since the death of Théo Faller 1979, it has been run by his widow, Colette, along with daughters Cathérine and Laurence. Wine writers rarely consider the Domaine without observing that the three Faller ladies are beautiful and charming, which is indisputably true, but the more important fact is that their wines are among the very best in Alsace. Always marked by freshness and purity, they seem a bit drier and brighter since Laurence has taken over as winemaker. Like most Alsace domaines, Weinbach turns out a wide range of wines at varied levels of ripeness made from Riesling, Gewurztraminer, Pinot Gris, Muscat, Pinot Blanc, Sylvaner and Chasselas. Unlike most Alsace domaines, Weinbach bottlings are uniformly superb, as even the widely neglected Sylvaner and Chasselas are accorded serious treatment. Although the wines may be serious, the imposing villa is enlivened by laughter from the several reception rooms and the frequent comings-and-goings of friendly customers from all over Europe. You too will feel like a friend of the Fallers after a single stop here, and you’ll never return to Alsace without making a point of visiting again. Bordeaux has everything going for it. It produces more wine--and more great wine--than any comparable region on the planet. Red, white, sweet, dry--you name it, Bordeaux makes it, and makes it at the very top level of quality. With scores of storied properties and an impressive chateau around every turn, could there be a drawback to touring in such an area? Maybe one. Bordeaux is sometimes accused of being a bit stuffy. Defenders might deny this, or Francophiles might acknowledge it but blame it on the influence of the English (who once ruled the region for 300 years). In any case, even if there is some truth to the generalization, there are plenty of exceptions, and my favorite is St. Emilion’s Chateau Troplong-Mondot. There is nothing remotely stuffy or self-satisfied about this Chateau, thanks to the pervasive influence of its delightful proprietor, Christine Valette. Cheerful, affable and funny, she is nevertheless resolute in her commitment to quality. Since assuming control in the early 1980s, she has overseen dramatic improvements at Troplong-Mondot, which has risen from mediocrity to consistent excellence. She has thoroughly modernized all of the winemaking facilities and drastically lowered crop loads in the vineyard to assure full ripeness and concentration in the finished wine. Much can be learned from a visit here, and the learning process could hardly be more enjoyable. The property is as beautiful as the wine is delicious, and both the venerable chateau (dating from 1745) and the large vineyard of more than 70 acres are very attractive. They are perched atop an escarpment at the highest point in the area, with views that are very fine aside from the single blemish of a huge water tower. But as the tower offers a perfect target for Valette’s sharp wit, it too will add to your experience. By contrast to the intense, powerful Cabernet Sauvignon, Pinot Noir is widely touted as the ultimate grape for producing wines of delicacy and finesse. If asked to point to the place on the globe from which Pinot Noir displays these characteristics most compellingly, I would point to Volnay, and if asked for a demonstration, I would lead you to the house of Michel Lafarge. Forbearers of the Lafarges have been making wine in the medieval village of Volnay for over two hundred years, and Frédérick Lafarge in a way that carefully balances respect for established techniques with openness to innovation. You’ll see some modern technology and new oak barrels here, but also biodynamic farming and some seemingly ancient casks as well as portions of the cellar that date from the thirteenth century. Lafarge owns parcels of vines that permit him to produce Bourgogne Rouge as well as some Beaune and Pommard, but this is emphatically a Volnay house. Bottlings include a Premier Cru sourced from several distinct sites and a Vendange Selectionnée made from the oldest vines. Clos-du-Chateau-des-Ducs is an impressive wine drawn from a parcel very near the house, but Clos-des-Chênes is the domaine’s flagship, featuring an uncanny combination of delicacy and longevity. To visit in Epernay with Pascal Leclerc is to peer into the future of vineyard hospitality in France. On one hand, he is a supremely earnest vigneron, growing his grapes biodynamically and crafting wines that are among the most intricate in all of Champagne. Yet Leclerc is no less an entertainer than an artisan, as shown by awards he has won from the Tourism Council. Wine aficionados tasting at the house will be treated to as many as eight different wines, all of which are highly individual. Even the most experienced taster will be fascinated by three bottlings in the “Les Authentiques” series that are sourced from old vines in three distinct sites, brilliantly reflecting the influence of terroir on taste. However, one who is thoroughly indifferent to wine could likewise find a visit here utterly enjoyable. Ten different touring options are detailed on Leclerc’s flashy website. Whereas wine geeks will opt for guided tours through nearby vineyard plots, others may opt for a lesson in slicing open bottles with a saber or a chance to rappel into the pure chalk cellars down a 100-foot shaft. Traditionalists will no doubt wonder if Leclerc has gone too far by offering “laser ball trap shooting” in the cellars as an attraction, but their disapproval is likely to wilt before his beaming smile and beautiful wines. Years ago I cut my wine-touring teeth in slack-jawed amazement at Napa’s nouveau wine palaces, but my personal tastes have turned toward visits with smallish producers making distinctive wines in more modest facilities. 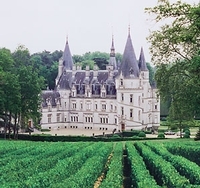 However, I confess that I am still a sucker for a real palace, especially in a form as fabulous as that of Patrick de Ladoucette’s Chateau du Nozet. Surrounded by perfectly hedged vines in a gorgeous setting in Pouilly-sur-Loire, this soaring spectacle would be a draw in its own right even if it did not also produce the world’s most famous Pouilly-Fumé. The oldest building on the property is a former press house that turns 200 this year, yet new winemaking facilities were completed in 1990, allowing you to tilt your tour toward history or technology according to your preference. De Ladoucette’s regular bottling of Pouilly Fumé is perhaps the most consistent of all Sauvignon Blanc-based wines made in the Loire, partly because it is painstakingly blended from base wines vinified separately from grapes grown in all four of the region’s different soil types. Lucky visitors are sometimes invited to taste these components in unblended form, and luckier still of those invited to taste Baron de L, the house’s deluxe bottling. It is made only in top years from the first pressing of the oldest vines, and the 1996 remains the finest Sauvignon ever to pass my lips. Bandol is potentially one of the greatest wines of France, and yet it remains virtually unknown among Americans. Those few who have indeed tasted it have mostly done so by dumb luck (or unwitting good fortune, if you prefer) while visiting Provence or the French Riviera. And even in these cases, the lucky travelers were probably so blissed-out by the spectacular surroundings and amazing food that the wine is now recalled as little more than a peripheral element of a generally wonderful experience. However, if tasted attentively, Bandol is never forgotten. Surely the most memorable of all renditions are those wrought by Domaine Tempier, which has been the region’s acknowledged leader since the 1940s. Reds comprise about two-thirds of the production here, and most of that is made from the obscure but marvelous Mourvedre grape. Mourvedre is important in Spain but almost impossible to ripen in France, and the key to its success in Bandol is the intense sunlight that burns for roughly 3,000 hours each year. Tempier lies at the heart of the scenic Bandol appellation, which is set between Marseilles and Toulon just above the Mediterranean. Family owned since 1834, it was made famous by Lucien Peyraud and then run by his sons Jean-Marie and Francois, who delegated day-to-day duties several years ago, but remain as thoroughly-informed directors. Both the vineyards and the winery offer interesting blends of traditional and modern elements, and the thoughtful proprietors have much to teach. So too do the wines, including a delicious white, my favorite rosé in the entire world, and five different bottlings of red that set the global standard for Mourvedre.